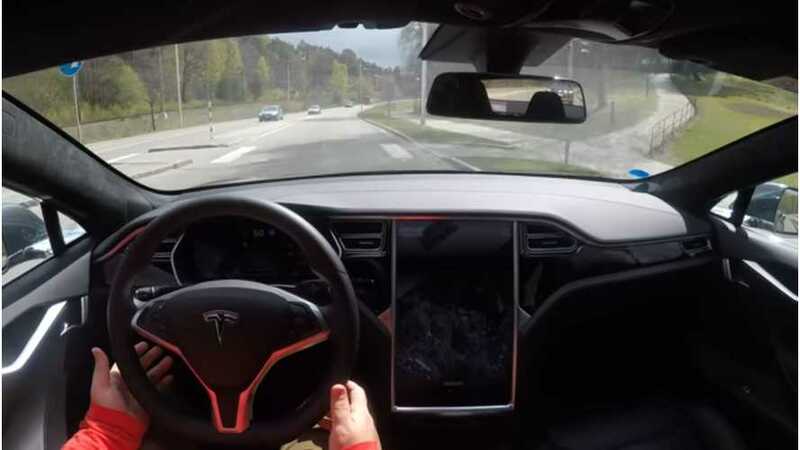 Videos prove that the latest Tesla Autopilot 2.0 update makes for a much improved freeway driving experience, however, navigating local poorly-marked roads is a different story. As you can clearly see from the video above, Tesla's Autosteer is still not up to par on local roads. The driver notes frequent times that the Autopilot system wants him to take control. It isn't seeing lines or curbs, and at one point it nearly drives directly into a center divider. This video is telling because the driver has driven the route before and he directs our attention to certain areas, explaining what happened in the past, compared to what we are seeing happen with the updated Autopilot. Testing out Autosteer on my usual test run on a local road with the new firmware version 8.1 17.17.4. This version is performing very poorly on this local road. The tracking of the lane markers and the curb is much worse than previous versions. It has a hard time making the turns and turns of Autosteer multiple time where it has performed much better in the past. Not in this video but, this version seems to perform much better than previous on highways and multi-lane roads with good lane markers. Opinions are mixed, however. The above video shows a Tesla faring quite well on France's curvy highway roads. Perhaps the fact that it's a highway, and that the markings are more clear, makes all the difference. The road surface looks new and is dark in color, and the white lines are thick and vibrant. He's even able to change lanes using Auto Lane Change while in the midst of a curve. Though the video is entitled "French Curvy Road," and there are surely some wide bends in the highway, it isn't all that curvy. The video above shows another Tesla owner on a curvy two-lane highway. The roadway is more similar to the first video, however, again the markings are more pronounced. He isn't dealing with intersections or high traffic areas. Essentially, it's a single lane with a clear yellow dividing line, and nothing but farmland off the shoulders. Again, not nearly quite curvy or demanding as the first video. The takeaway from all of this is that the Tesla Autopilot update seems to be much improved when it comes to highway driving, and on well-marked roads, without lane splits or major intersections. But, as soon as you add such "challenging" situations, it's clear that Tesla still has some work to do. In this test run Autosteer works really well for most of the time. Very commutable and smooth in most turns. The challenge are tight turns, blind corners and crests.